Glister for Cleaner, Whiter and Healthier Teeth. This post is on a toothpaste from the brand Amway. My favorite toothpaste is Patanjali Dant Kanti Dental Cream and have been using it for years. But recently when I was out of stock of the Patanjali Dental Cream, I tried the one from Amway. Since my Mom is is a member, she brings a lot many products of Amway very frequently and I keep using them when desired. I have used few of its products like the Amway Sheer Foundation, its Glycerine Honey Shampoo but I really like Amway Attitude Kajal Pencil. 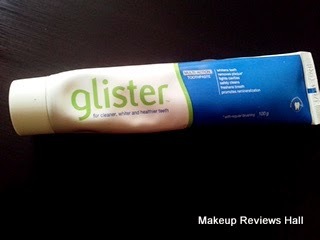 Everyone in my family except me use this Glister toothpaste since they don't like the color and taste of the ayurvedic and herbals toothpaste. 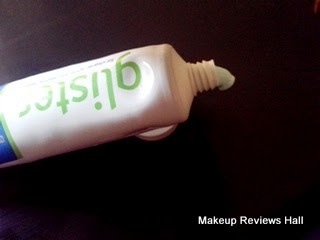 Anyways this time even I tried this Glister tooth cream and here is the review on it. One toothpaste does it all: whitens teeth, fights cavities, removes plaque, freshens breath, promotes remineralization, and prevents demineralization. All with regular brushing. Great for the whole family. A million dollar smile begins with the revolutionary Glister Multi-Action Toothpaste. It contains Sylodent, a polishing agent which effectively polishes & whitens your teeth without excessive abrasion while its unique formulation fights cavities and removes plaque. It also reverses the onset of cavity by remineralizing teeth. Glister has a refreshing mint flavour that freshens your breath and gives you that extra confidence. Reminact formula helps redeposit essential minerals back onto the enamel to make teeth stronger and more resistant to decay. Glister multi action Fluoride toothpaste with regular brushing helps remove plague, gently removes surface stains and discoloration, such as those caused by coffee, tea and smoking offering enamel safe polishing. Price - Rs 146/- for 100g. This Amway toothpaste comes in a regular tube packaging and is white and blue in color with green Glister label. The cream appears to be of blue green shade and has a strong aroma of peppermint like in many other dental cream products. Though this is quite expensive when compared to other toothpaste brands like Colgate, Oral B, Close Up but the amount required per time to clean teeth properly is quite less in case of this toothpaste, which actually makes the paste lasts longer thus making it not so expensive. Just sufficient amount of this paste makes teeth very clean with a refreshing and cooling sensation inside. Along with this, it also makes breath fresh for a longer period as claimed. But I don't think it works on other claims as well, like I didn't feel any kind of whitening effect and don't really know f it really fights cavities since I don't have any, touchwood, but my mother do suffer from cavities and she didn't feel any benefit of using this glister toothpaste. But it definitely works very well, in giving you clean and healthy teeth free from all sorts of odors and fresh breath as claimed. Read Amway Sheer Foundation Review. Overall I think its a good daily use dental cream, which is slightly expensive than the regular toothpaste, but less usage of this makes this last longer and pretty affordable. I don't know if this can be replacement to a herbal and ayurvedic toothpaste since each one has its own pros and cons. The ayurvedic one do more good but taste slightly weird which is not the case. so its a matter of your own choice. If you have no problems with ayurvedic taste and smell, you can go for any other, but if like commercial brands, then this Glister toothpaste is definitely a good option. Makes teeth cleaner and healthier. No whitening effect as claimed.